Cheraw FFA competed in the Region 3 Tool Identification, Creed Speaking, and Prepared Public Speaking Career Development Events held at Darlington County Institute-Tech on March 12th, 2019. The Tool Identification Team consisted of Cale Burch, Noah Hatcher, Jaylen Henderson, and Aiden Quick. The Tool I.D. Team placed 4th in the Region. 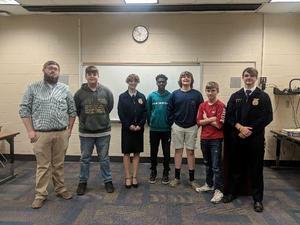 Emma Counts competed in the Upper Division of the FFA Creed Speaking Event, she placed 8th in the region. Luke Dixon competed in the Prepared Public Speaking Event where he placed 3rd in the region.